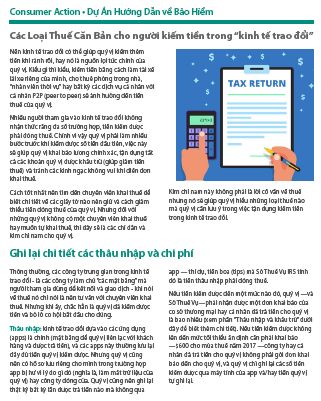 Library: Vietnamese | Tax basics for earners in the ‘sharing economy’ (Vietnamese) . Library: Vietnamese | Checking and savings accounts (Vietnamese) A wise choice. 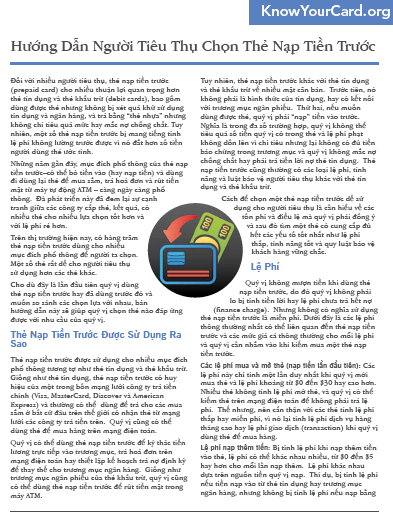 Library: Vietnamese | Teens & Money - Talking to teens about money (Vietnamese) . This 24-page booklet is designed primarily for parents but may also be useful for older teens. It covers many topics, including working, budgeting, figuring out if a purchase is a “need” or a “want,” banking, writing checks, savings, credit cards, credit reports, driving and cell phones. The booklet contains illustrations and examples of a weekly spending evaluation, a paycheck stub, how comparison shopping can save money and how to write a check. It also contains a list of helpful web sites for parents and kids. Library: Vietnamese | Prepaid Cards (Vietnamese) An alternative to credit and debit cards. Learn how reloadable prepaid cards are different from other forms of “plastic,” how to select the best prepaid card for your needs, how to reduce card costs and how to manage your card account wisely. Library: Vietnamese | Your Digital Dollars - Mobile Banking and Mobile Payments (Vietnamese) Make financial transactions safely on the go. 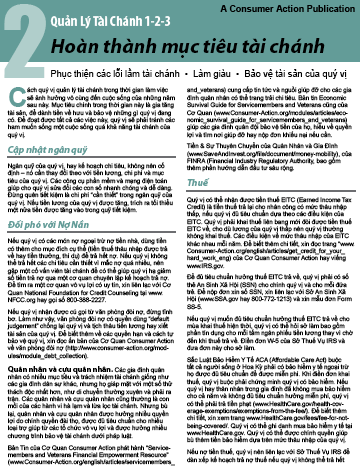 Library: Vietnamese | Your Digital Dollars - Banking Online Safely (Vietnamese) Protect your identity and accounts while banking by computer . 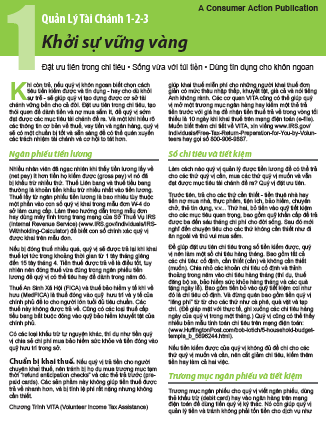 Library: Vietnamese | Saving to Build Wealth - Make money work for you (Vietnamese) . Library: Vietnamese | Manage Your Money Wisely - Tracking your money (Vietnamese) . 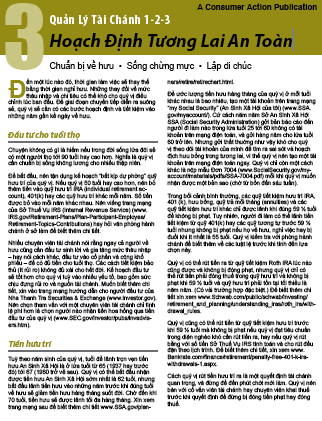 Library: Vietnamese | Staying on Track With Credit (Vietnamese) . Library: Vietnamese | Banking Basics (Vietnamese) Những Điều Nên Biết Về Trương Mục Vãng Lai. An illustrated fact sheet that explains how to open a checking account. Explains different kinds of accounts and their fees, check processing, automatic deposit and bill paying, and ATM/debit cards. Library: Vietnamese | Surviving and Controlling Debt (Vietnamese) Bạn Phải Biết Mình Muốn Gì. An illustrated fact sheet that discusses the importance of managing debt so that it does not become a problem. Explains debt danger signals and how to reduce debt. Also explains collection agencies, debt counseling, and bankruptcy. Library: Vietnamese | Budgeting and Planning (Vietnamese) Xây Dựng Một Tương Lai Tốt Đẹp Hơn.